A family spends a delightful two days paddling and hiking in the St. Regis Canoe Area—and, best of all, there were no long carries. The author and Dominic Ballard ferry a four-legged friend across Turtle Pond. SOMETIMES my choice of canoe-camping adventure in the Adirondack Park is based on the lowest chance of family mutiny. My husband Jack and our three teens, Parker, Dom, and Zoe, still reeled from the memory of a 1.25-mile carry around Raquette Falls during a two-nighter down the Raquette River a year ago. Loaded down with heavy boats and an overabundance of unorganized gear, we had grossly underestimated the portage distance and the ferocity of welt-inducing mosquitos. 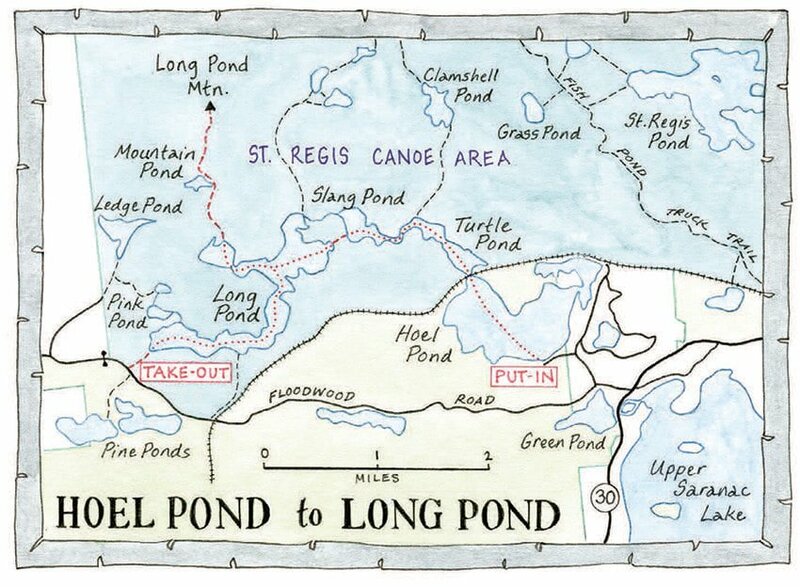 I was loath to ask my clan to ever portage again, but when the opportunity arose to paddle from Hoel Pond to Long Pond in the St. Regis Canoe Area, the desire to introduce my family to this eighteen-thousand-acre, motorboat-free canoeist’s Eden was too great. 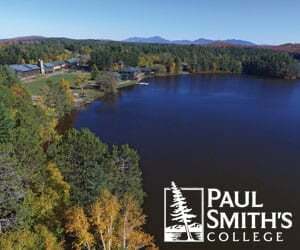 The St. Regis Canoe Area—the only designated Canoe Area in the Adirondack Park—is located southwest of Paul Smiths. St. Regis Pond (401 acres) is the largest of the sixty or so lakes and ponds and 386 wetlands in this web of water. 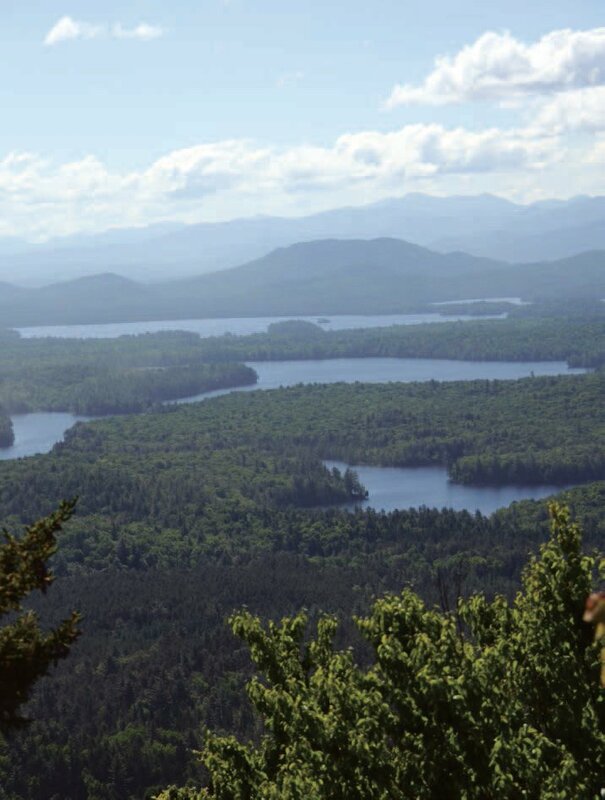 The patchwork of land between the ponds rolls gently from shoreline to shoreline punctuated by two prominent peaks, St. Regis Mountain (2,874 feet) and Long Pond Mountain (2,530 feet). One of the draws of canoeing from Hoel Pond to Long Pond was the chance to climb Long Pond Mountain, accessible only by water. The other was paddling across four scenic ponds—Hoel, Turtle, Slang, and Long—which constitute part of the classic Nine Carries canoe route. 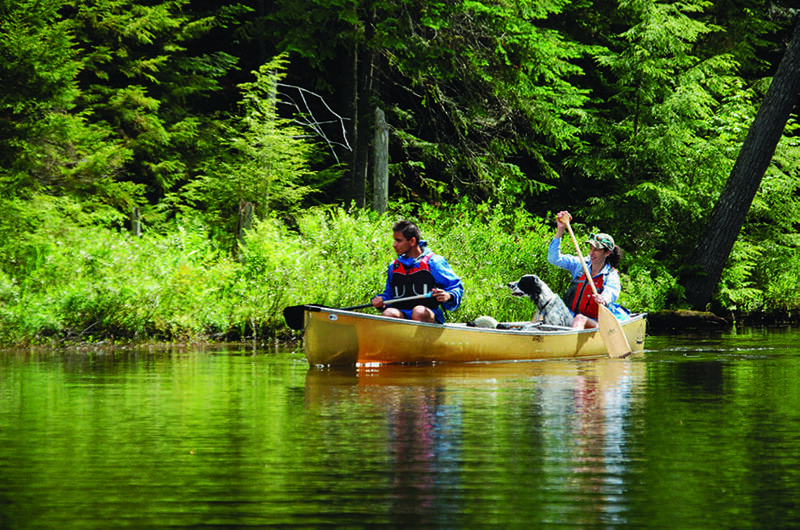 Nine Carries is one of the earliest recreational canoe trails in the Adirondack Park. Outdoorsy visitors first paddled it in the 1850s when pioneering hotels and guide camps were built on nearby lakes. The locations of most of the carries date back to this early era. In 1898, the state of New York purchased big tracts of land in the area, though the ban on motorized boats, vehicles, and fl oatplanes did not occur until 1972. 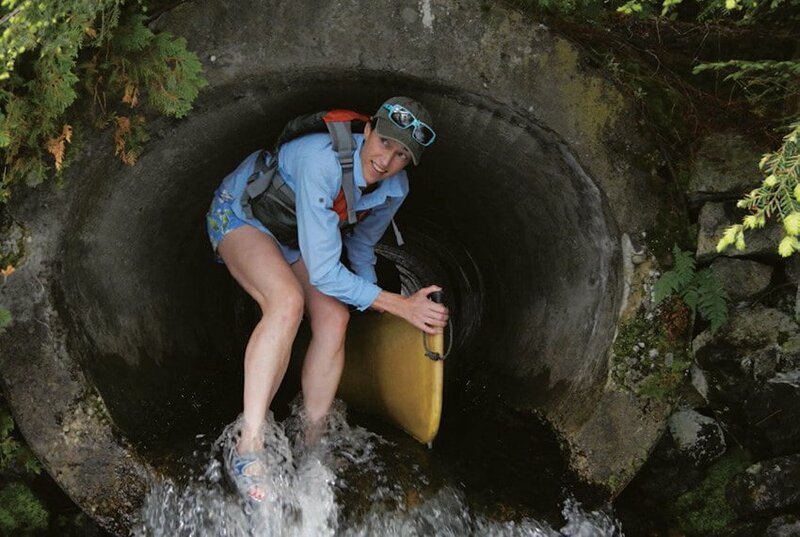 The effect of this ban was to create a true backcountry experience for paddlers, especially for those willing to haul their boats over the short tracts of land between bodies of water. Lisa jots notes on the shore of Long Pond. 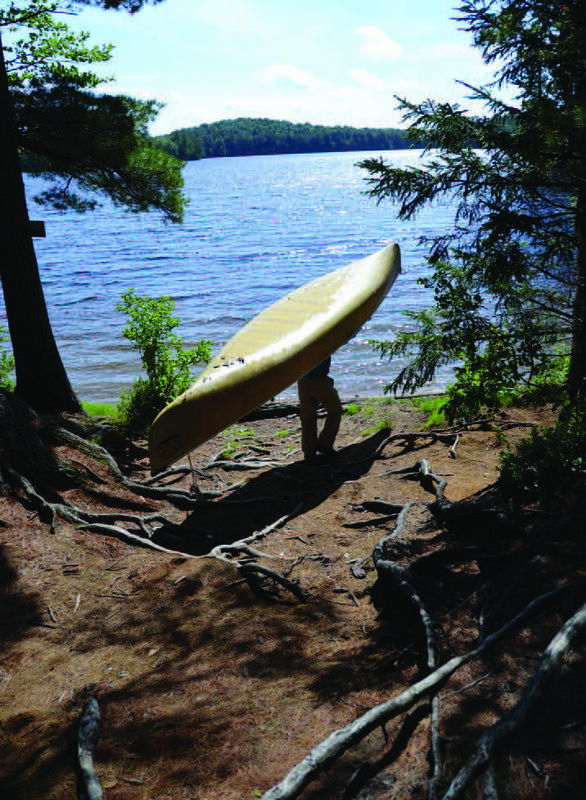 The put-in and takeout we planned to use, at Hoel Pond and Long Pond, are two of of the five most popular public-access points in the St. Regis Canoe Area. (The other three are on Floodwood Pond, Little Clear Pond, and Upper St. Regis Lake.) Of the nineteen miles of trails in the area, half are canoe carries under a half-mile long. We figured we could handle the latter distance whine-free as long as we packed lightly. The five-mile paddle from Hoel Pond to Long Pond is easily doable as a day trip. 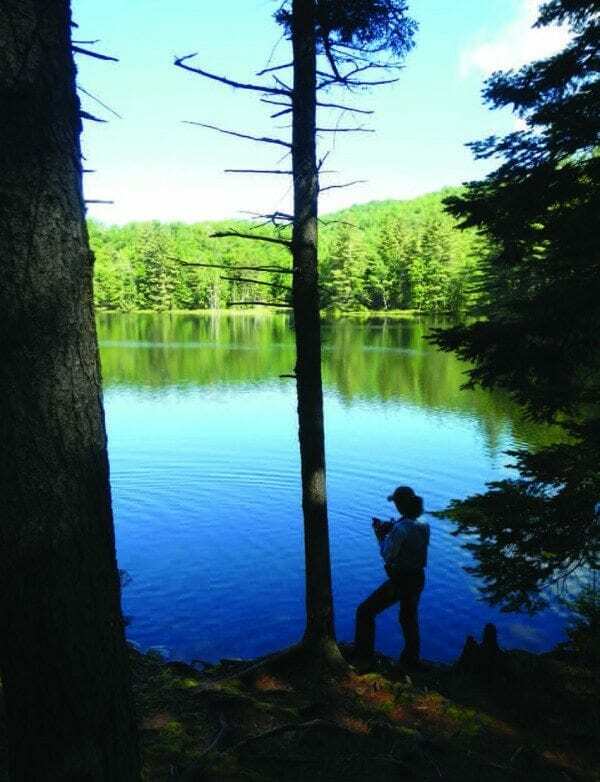 It has three portages, the first over a railroad culvert between Hoel Pond and Turtle Pond (thirty yards), the second between Slang Pond and Long Pond (0.2 miles),and the third to the trailhead parking lot on Long Pond (0.25 miles). However, we planned to spend the night at one of the twenty-two primitive campsites on the shorelines of Turtle, Slang, or Long. 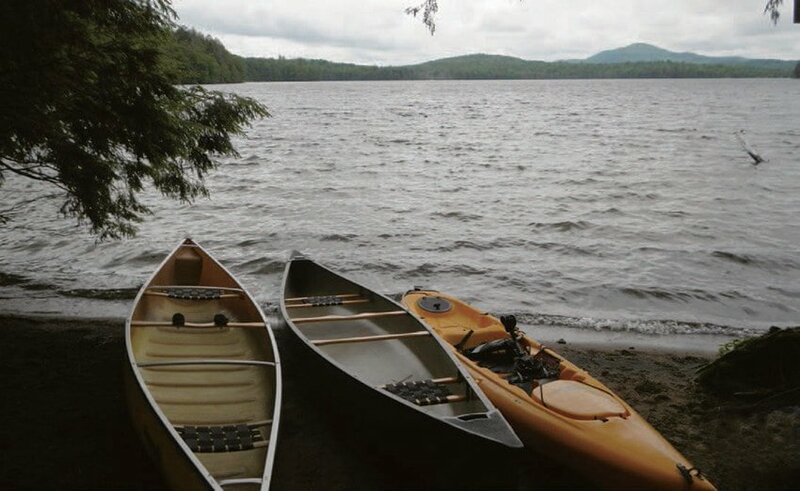 Many canoeists paddle west to east (Long Pond to Hoel Pond), the direction of the prevailing winds. We opted for the opposite direction because the forecast was calm. 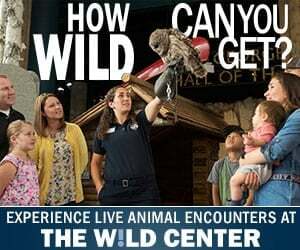 What’s more, Hoel Pond is not in the St. Regis Canoe Area. It abuts it. While not intrusive, camps exist along its southern and eastern shorelines and the railroad corridor runs along its northern shore. It seemed more aesthetic to begin the trip in sight of these minor intrusions of civilization and then leave them behind. The put-in on Hoel Pond. Hoel Pond was originally known as Minnewawa Pond, which loosely translated from Ojibwe means “depth be shallow.” It’s a misnomer as the bottom of the pond dips down sixty feet at its deepest point. Early French fur trappers may have encountered Ojibwe from Ontario hunting in the region. By the mid-1800s, the pond’s name changed to Hoel, perhaps in honor of a pond-side homeowner. The medieval King Hoel of Brittany who joined King Arthur’s roundtable and William Hoel, a highly decorated naval commander for the Union during the civil war, are among the other possibilities. Though neither of these military legends visited the pond, they inspired me as I dug my paddle over and over into the dark, choppy water, musing that our miniature armada was embarking on a valiant quest. The mile-long crossing of Hoel Pond proved more work than I anticipated. We launched our boats at 2 p.m., the breeziest part of the day. The touch of moving air on land magnified into a stiff headwind on the water. Even though we paddled with the flow, there was no noticeable current to aid our efforts. Low waves nudged persistently against the bows of our boats, particularly the one I captained with my stepson, Dominic. Rented for this expedition for its lightweight Kevlar construction, its high bow and broad beam were a counterproductive wind-catch. And while our decision to bring only the bare necessities would ease the portages, without much of a load, our canoe floated high in the water. Crossing the water to the first portage required consistent, strong strokes. By the time Dom and I reached the takeout, the other two boats were nowhere to be seen, which puzzled us. Dom and I were slower, but not that slow. The others had reached the takeout perhaps ten minutes ahead of us, hardly enough time to unload and make the carry over the railroad tracks, short as it was. Then I spotted Jack emerging from the base of the steep bank. I smiled. The culvert under the railroad tracks was passable, saving us one portage. A shallow stream of water about four inches deep flowed through the culvert and then cascaded out the other end into Turtle Pond. Dom and I gingerly walked our canoe through the damp, slippery tunnel. When we re-emerged into the sunlight, we found Zoe nursing a scraped knee. She had slipped making the last big step from the culvert onto submerged rocks. Luckily her wound proved minor, and we resumed our voyage. Lisa Densmore Ballard takes the shortcut to Turtle Pond. The paddle across Turtle Pond was less demanding. It’s a smaller, narrower body of water, about eight-tenths of a mile long, and we made good time, easily finding the winding narrow waterway to Slang Pond. A mere ten feet off from the bow of his kayak, a loon peered cautiously at our crew, its neck stretched flat against the water. Several breeding pairs of loons as well as herons and other shorebirds, ducks, songbirds, and raptors inhabit the St. Regis Canoe Area. I scrambled to get my camera out of a dry bag, but I was too late: the loon slipped silently under the water, resurfacing moments later about a hundred feet away. After a second glance, it disappeared underwater again. The half-mile paddle across Slang Pond took a little longer. We paddled leisurely while Jack, Zoe, and Parker cast for bass. Though no fish found their lures, the anglers weren’t disappointed. The tone of the afternoon had slipped into a casual, stress-free pace induced by the warm summer sun and our serene surroundings. The portage to Long Pond proved much more pleasant than the Raquette Falls one a year ago. The trail was wide, flat, smooth, and short. No one complained. After relaunching the boats, we began to look for a campsite. Long Pond is well named. It’s shaped like a 2.5-mile long U, with an additional arm off its northern side. We made our way toward the end of the branch where the carry to Mountain Pond lay. The trail up Long Pond Mountain passes the northern shore of Mountain Pond. Zoe, Dom, and Jack Ballard roast hotdogs over the campfire. We selected a tent site near the start of the trail to Mountain Pond, then settled in for the evening. A dense carpet of pine needles covered the secluded clearing, providing a comfortable place to pitch our tents. As darkness descended, Jack, Dom, and Parker nursed a campfire into a modest blaze. “Where’s Zoe?” I asked, pulling the fixings for S’mores out of a dry bag. “She’s fishing by the boats,” replied Jack. As if on cue, we could hear Zoe suddenly slosh excitedly in the water. “Got one!” she shouted, hoisting a wriggling pumpkinseed. She grinned ear to ear knowing she had landed the first (and only) fish of our overnight expedition. Long Pond Mountain’s view of the Canoe Area. The next day, we arose without a rush, starting up the path to Mountain Pond around 9 a.m. 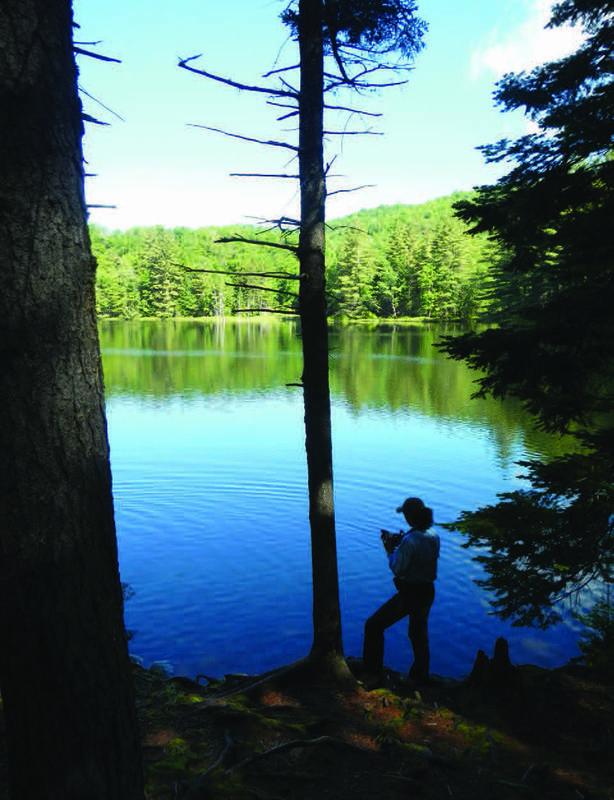 The 1.6-mile trail cuts through a forest of ferns and tall pines to the pond, then arcs around its eastern shore before turning up Long Pond Mountain. Parker and Dom hiked ahead of Jack, Zoe, and me and waited for us at a half-buried boulder we dubbed “rest rock” about halfway to the summit. From there, the sparsely travelled trail curled down through a small boggy spot before climbing stiffly upward. Smooth footing helped make the steep climb more hiker-friendly. Though the wild blueberry bushes grew prolifically beside the path, they bore unappetizing tiny green bulbs. We paid them little heed, pausing instead to admire the blooming lady-slippers and sheep’s laurel. The summit was a pleasant surprise, an open rocky top with a pleasing 180-degree view of our canoe route below and the High Peaks on the horizon, but we didn’t loiter long. The mosquitoes found us, forcing a retreat back to our campsite. We packed up and embarked on the final leg of our voyage across Long Pond. We reached the takeout twenty-four hours after putting in at Hoel Pond. What we had originally considered a simple overnighter had turned into a delightful Adirondack sampler that included paddling, fishing, loon watching, camping beside a pond, and hiking to an expansive view of the High Peaks. It would be easy to recruit my family on another canoe-camping trip if they were all like this one. Directions to put-in on Hoel Pond: At Saranac Inn, turn west off NY 30 onto Floodwood Road. Go 0.4 miles to Hoel Pond Road. Turn right and go 0.2 miles to a dirt road on the left. Turn here and go 0.3 miles to the Pond. Directions to takeout on Long Pond: From the junction with Hoel Pond Road, continue another 4.9 miles on Floodwood Road (gravel). A mile past St. Regis Canoe Outfitters, turn right into a parking area. A carry trail leads 0.25 miles to the canoe launch.